Tropezia Palace Casino :: Lion’s Roar slot – PLAY NOW! The king of the jungle is leading the pride on a hunt for riches with Lion’s Roar, Rival’s latest 5 reel slot. Join the Lion and Lioness as they prowl the savannah collecting tribal Coins, Masks, Statues, and Shields. Branded 9, 10, Jack, Queen, King, and Ace symbols complete this slot’s icon set. The stalking Lion’s Roar icon is Wild. During Free Spins the lion will leap to fill the entire reel with an Expanding Wild! 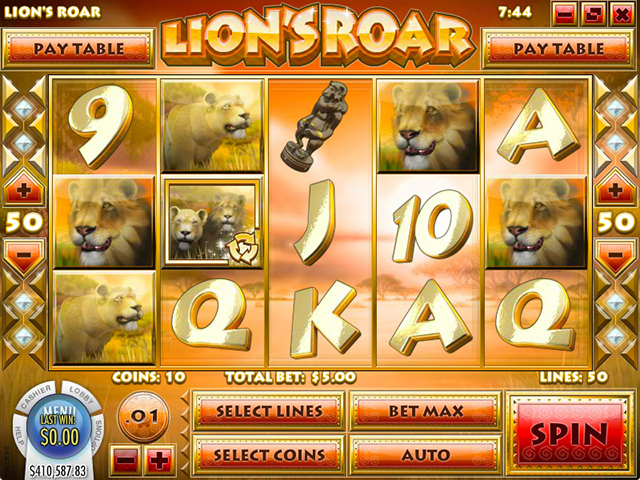 Free Spins are awarded when three or more Lions Pair icons appear. During the Free Spin Round, trigger the Roaring Free Spins by collecting an additional three or more Lions Pair icons. Expanding Wilds during the Roaring Free Spins have a 5x multiplier, to assist you in winning the lion’s share of coins.